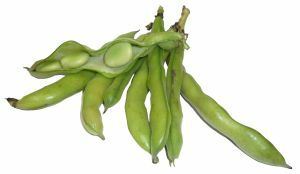 Vicia faba, also known as the broad bean, fava bean, faba bean, field bean, bell bean, rangoon vaal, vaal beans, lilva beans or tic bean, is a species of bean native to North Africa, southwest and south Asia, and extensively cultivated elsewhere. It is a rigid, erect plant 0.5-1.7 m tall, with stout stems with a square cross-section. The leaves are 10-25 cm long, pinnate with 2-7 leaflets, and of a distinct grey-green colour. The fruit is a broad leathery pod, green maturing blackish-brown, with a densely downy surface. Each pod contains 3-8 seeds; round to oval and 5-10 mm diameter in the wild plant, usually flattened. Broad Beans is a rich source of different nutrients, vitamins and minerals including: protein, fibre, vitamins A, C and K, the minerals magnesium, potassium and iron. 1. Fava beans are used in a number of different recipes and can be prepared using a variety of cooking techniques. They are frequently braised and used in stews, and can also be sautéed, or marinated and served in salads. 2. Fava beans can used as a main ingredient in making puréed soups ( Also see ). They are also frequently served with pasta or risotto. 3. A simple recipe for fava beans would be to sauté them with bacon or pancetta until tender and then serve topped with melted butter and shaved pecorino cheese and freshly ground black pepper. 4. The beans can be fried, causing the skin to split open, and then salted and/or spiced to produce a savoury crunchy snack. These are popular in China, Peru (habas saladas), Mexico (habas con chile) and in Thailand (where their name means "open-mouth nut"). 5. In the Sichuan cuisine of China, broad beans are combined with soybeans and chili peppers to produce a spicy fermented bean paste called doubanjiang. 6. In most Arab countries the fava bean is used for a breakfast meal called ful medames. Ful medames is usually crushed fava beans in a sauce although the Fava beans do not have to be crushed. 7. In Iran, cooked broad beans served with pepper and salt are sold on streets in winter. This food is also available conserved in metal cans. 8. Whole Rangoon vaal can be used in varied preparations ranging from salads and soups to stir-fries, masala, curry, Briyani. 9. Soaked dal can be cooked till soft, and then prepared like any other dal called Sambar. 10. In Indonesia, they are made into a popular dessert snack which has the consistency of porridge. The beans are cooked with sugar, coconut milk, and a little ginger. 11. A tangy dish is made in India by mixing cooked vaal with jaggery, tamarind and onion- ginger- garlic paste. 12. Whole vaal can be soaked in water and ground to make a batter for dosa or uttappams. 13. Vaal ni dal, Vaal nu pulao and Vaal usal are popular dishes of Maharasthra. 1. This beans has very low saturated fat, cholesterol and sodium. It is also good source of fiber, contains high protein, phosphorus, copper and manganese, and a very good source of folate. Above all that it is iron-rich beans. 3. Broad Beans are a source of both types of dietary fiber, soluble fiber.consuming soluble, fiber-rich foods may help improve your blood sugar and cholesterol levels. Soluble fiber is particularly effective at lowering low-density lipoprotein (LDL) cholesterol levels, commonly referred to as “bad” cholesterol. 4. It is rich in fiber, which is required by the body to move food through the digestive system. 5. Broad Beans has high concentrations of an amino acid known as L-dopa (dopamine), which works as a neurotransmitter in the brain. 6. The good amount of potassium in Broad Beans-Chikkudukaya-Fava beans helps the body maintain blood pressure and regulate heart function. 7. Broad Beans-Chikkudukaya-Fava beans are a very good source of phosphorus in the body, which is required for the formation of healthy bones and teeth. In addition, it also helps the body utilize vitamins. 8. It serves as a rich source of thiamin, which is essential to maintain normal nerve function. Recipes using Broad Beans see Here and Here and Here.